Author Patrick Morley coaches dads to love, encourage and influence their children while they are under their care. By doing this himself, Patrick broke the dysfunctional patterns of his past, and also tells how he bridged the gap emotionally with his father at the age of 35. Bob: Patrick Morley remembers an event that took place, late in his father’s life; but, thankfully, not too late. Bob: This is FamilyLife Today for Wednesday, June 5th. Our host is the President of FamilyLife®, Dennis Rainey, and I’m Bob Lepine. We’ll hear from Patrick Morley today about the incredible power of a father’s words in his son’s life. Stay tuned. Dennis: In 20 years of doing radio, I’ve never done what I’m about to do to the guest, here, on today’s broadcast. That ought to make him feel really special. Bob: I’m a little nervous. What are you going to do? Dennis: Well, I’m going to ask him to do something at the end of the broadcast. Bob: And you’re going to tell him, now, what it’s going to be? Dennis: You shared—in 1926—how your dad was born into a very tough family. His dad abandoned him. He didn’t know how to be a man, husband, father. You grew up in that family. It was pretty tough for you, as a boy. You ran away from home the summer after you had moved through the 10th grade—didn’t end up graduating from high school. A lot of things had taken place—tough situation with your father. I’m going to ask you, at the end of the broadcast, to seat your father across the table from you and give him a tribute. Patrick: Oh, that’s easy. Yes. Dennis: I bet you can. Dennis: I bet it’s easy. Patrick: Bob, can you get him under control? Bob: I do not—I cannot. Patrick: The most courageous thing that I’ve ever done? Dennis: Courage is not the absence of fear. It’s doing your duty in the face of fear. Patrick: Yes. Courage, out of Webster’s Dictionary, by the way, is the quality of state of mind or spirit that enables one to face hardship or disaster with confidence and resolution. I would say that the—my answer to the most courageous thing I ever did was to reconcile with my father—which, maybe, I’ll save to the end of the broadcast because that would be the tribute; or I could go ahead and do it now. You tell me. Dennis: We’ll save it for the end of the broadcast. We’ll just let that be the total package, at the end. Share with our listeners about Man in the Mirror Ministries. You’ve written a book by the name of that. That gave birth to a whole movement of men. What’s going on? What’s happening today? Patrick: Well, it’s very exciting, Dennis and Bob. First of all, I just want to tell you that David Delk is actually now the President of Man in the Mirror. Bob: And David has been a guest, here, on FamilyLife Today. Patrick: And he’s been a—he’s been a guest here. Bob: Wrote a great book called The Marriage Prayer and is doing a great job leading the organization. Patrick: Oh, he’s phenomenal, along with all of our other staff, but—so, our vision is for every church to disciple every man. What we do is we help churches be more effective in men’s discipleship. We’ve developed a model—over the last 20 years—that produces very substantial results for churches. So, just as a stewardship, we feel a duty to proliferate this model to as many churches as possible. So, big idea: We’re hiring 330 full-time area directors—one for every 1,000 churches, situated geographically, around the United States. The idea is to put boots on the ground—men in community. We still have yet to place one here in Little Rock. Orlando—where we’re located—for example, the area is big enough to have two area directors in Orlando—one, east and one, west. These men will essentially develop relationships with a hundred of the churches in the area, over the first three years. That’s about three a month. Then, help them be more effective in reaching men. So, if each of those churches, then, disciples ten new men a year, we’re talking about being able to disciple a million men a year. Patrick: So, it’s very exciting. Dennis: Three hundred thirty—where are you at? Patrick: —we’ve appointed the first 50. It’s taking about a year. So, you can kind of do the math. It’s steady-plodding kind of thing. So, if it resonates—the idea of helping churches to be more effective at discipling men—if that resonates with you, you can go to AreaDirectors.org and get all the information—job description, frequently-asked questions. There is a little video there and just all the information. Bob: —at FamilyLifeToday.com—for those who want to go there in case they weren’t able to get the link. Just go to FamilyLifeToday.com and click over and find out more about what’s involved in being an area director. Dennis: I’m excited about this, Pat, because you’re a kindred spirit with us. We believe the hope of our country is in laymen and women—put the tools in their hands, get out of their way, commission them. Let those who have the passion in their chest—that’s burning to do something about the decline of our nation, spiritually—make a difference where they live. Just like Nehemiah went back to the city of Jerusalem and rebuilt the wall. He encouraged people to rebuild the wall in front of their own houses. That’s how he got it done in a little more than 50 days. So, I think you are on something big. I hope that men, who are listening today, will take your charge, and a lot of them will explore this, and step out in faith. Patrick: And by the way, we have the full-time position. Just last week, we also launched a part-time position, as well. Bob: Pat, when a guy has got his relationship with God right—when he’s living in harmony with God—he can still struggle in his relationship with his wife or with his kids. You’ve learned lessons over the years—40 years of marriage. You’ve got two kids, four grandkids; right? Bob: If you were sitting down with a young husband, who is saying, “I’m just struggling here,” and you could offer him some of the counsel of your years of experience, what kind of tips would you pass on to him? What have you learned? Patrick: Well, I do mention a number of these in the book, Man Alive. Something that is a little bit beyond the book—just so we can go there—a little value added, here, if you will. I think that the most important thing that I would suggest today, to a father, is to let your kids know how much you love them and how much you are proud of them—with a verbal affirmation as often as you can. I think I mentioned earlier about my father not making verbal and physical expressions of affection. That meant that either I repeat the cycle or I break the cycle. Well, I decided that I was going to break the cycle. So, I was there for every single one of my kids’ games. I actually took a job in commercial real estate. I took the job—I took, in part—so that I would be able to be at my children’s events. Now, not every father can do that; but I never missed a single kid’s event. I took every opportunity—in fact, every day, I told my children, “I love you,” and, “I’m proud of you,”—two phrases that I never heard. The little boy and the little girl—they long to hear the voice of their mom and their dad to say, “I love you, and I’m proud of you.” There is biblical precedence for this. God said, at the baptism of Jesus, and then, the Transfiguration, “This is my beloved Son”—I love him——and, “in whom I’m well pleased”—I’m proud of Him. So, God said, “I love Jesus, and I’m proud of Jesus.” There you go. You’ve got a little biblical precedent for that. Bob: Alright. Take us back to the husband—young husband. Bob: You took us right to the kids, and I understand why—given the story from your own life. Bob: What relational advice—how do you love your wife well, as a man? Patrick: Yes. The basic idea, as men, is that every time you and your wife have any kind of interaction—verbal or non-verbal—you are either making a deposit into her emotional bank account or you are making a withdrawal. A couple of examples—let’s just say you’ve had a tough day. Alright, you get home. You have your way of letting the family know—your wife know—that you’ve had a tough day. You slam the door as you come in. You kind of throw your lunch pail across the room. Patrick: —noise that imitates a large zoo animal; you know? [Growling noise] So, now—guys, is that a deposit or a withdrawal? Bob: That would be a withdrawal. Patrick: Okay. Okay, so, you get it. Now, let’s just say the next morning you feel like a jerk, which of course you are. So, you decide to bring her a cup of coffee in bed. What would that be—besides unheard of? Bob: That would be a deposit. Patrick: That would be a deposit. So, you get the idea. Guys, if your wife is trying to process with you a little spat—that, maybe, one the children had in the neighborhood, or somebody hurt her feelings—and you’re sitting there, with your arms crossed, and looking out the window—that doesn’t send a very good message. That’s a withdrawal. The point is there are lots of different ways that you can make deposits into your wife’s emotional bank account. Through research—time and talk are the two things that women say they most wish their husbands would do more of. More time: women will say, “We don’t spend enough time together; but when we are together, our conversation is not meaningful enough,”—and so, just spending time together. Men, who have relationships, great responsibilities—the chief responsibility of relationships is time. Give time to whom time is due—so carving out time for—to be with your wife. Here’s the problem—if you take the list of ten things she most likes to do and the list of the ten things he most likes to do—it’s very rare that your top thing will be the same for each person. So, you might have to go down to your fourth, fifth, or even sixth, or seventh interest to find something that you have in common. Maybe, you both like to go bowling—so, go bowling. Maybe, you like to go out to eat—go out to eat. You know, explore greasy spoons around town or whatever—but find something that you can do together and spend that time together. There are many others, but that’s really the top of the list. Bob: Part of what I hear you saying is that a husband has got to—he’s got to view his wife as the treasure that she is. When you have something that you treasure—that you value, that you esteem—you take care of it. You honor it. You devote time to it. Bob: And cherish her. Yes, that’s right. Bob: You remember this assignment that Dennis gave you at the beginning of the program? Bob: Yes, amnesia has sunk in here. Dennis: Yes, I think it has. Bob: I’ll tell you what. Before—we’ll refresh your memory on this—but before we do that, let me tell folks how they can get a copy of your book, which is called Man Alive. We’ve got it in our FamilyLife Today Resource Center. Go, online, at FamilyLifeToday.com and order a copy of Patrick Morley’s book, Man Alive. Again, the website, FamilyLifeToday.com; or you can call 1-800-FL-TODAY to request a copy, as well—1-800-358-6329. That’s 1-800- “F” as in family, “L” as in life, then, the word, “TODAY”. Patrick’s book is called Man Alive. We also have copies of Dennis Rainey’s book, which is called Stepping Up: A Call to Courageous Manhood. And this month, we are making that book available to you for free. If you contact us, we’ll send the book out to you. If you’ll just cover the cost of the postage and the handling, we’ll send you a copy of Dennis’s book; and we’ll include with it a DVD that has Session One from the Stepping Up™ video series for men and the first half of the first session of the Stepping Up video event—gives you an idea of what these video sessions are like. We hope you’ll consider, maybe, getting together with a group of guys over the summer or planning ahead for next fall—and gathering a group and going through the Stepping Up video series. It’s powerful material. It’s well-presented. You’ll see that when you order a copy of Dennis’s book, and you get the sampler DVD along with it. All you have to do is cover the cost of the postage and the handling. So, go to FamilyLifeToday.com to request the book and the DVD; and we’ll get that out to you. Or call 1-800-FL-TODAY and ask for the Stepping Up book and the sampler DVD. One more thing, really quickly, “Thanks,” to those of you who help support the ministry of FamilyLife Today. We couldn’t do this without you. We depend on your donations to help cover the costs of producing and syndicating this daily radio program. We’d like to say, “Thank you,” this month, when you make a donation, by sending you a CD—a message from Dennis on fathers and their children—what a dad can do to protect his sons and daughters, particularly, during the adolescent years. Go to FamilyLifeToday.com and click the button that says, “I CARE”, to make an online donation; or call 1-800-FL-TODAY to make your donation over the phone. Simply request the CD from Dennis Rainey when you donate, and we’re happy to send it out to you. We appreciate your support of this ministry. Dennis: Earlier, on the broadcast, I threw out the gauntlet to Pat Morley—had a tough relationship with his dad—a sweet man, a good man—but he came from a tough background—didn’t have a father himself. So, he didn’t know how to be a husband, a father, or a man, in that regard. So, Pat grew up with some challenges, in that regard. Patrick: Well, let me take you back to when I was 35 years of age. In my—so, I’d left home when I was in the middle of my senior year. I was gone. I was just so wounded. I mean, I didn’t understand anything that had happened to me. My parents didn’t understand it either. They loved me. I know they loved me. They just never told me; okay? So, when I became a Christian, I began to grow. By my early 30’s, I really wanted relationship with my dad. I called him on the phone one day. I said: “Dad, your birthday is coming up. Could I take you to lunch?” He was so happy to go. We had the most wonderful time. So, that became a tradition. Over the next two or three years, the relationship began to thaw out and become more personal. When I was 35 years of age, we were walking to the vehicles. I don’t know why; but I said, “Dad, could I have a hug?” Before I finished, he had grabbed me, and he hugged me like a grizzly bear. By the time he was done, we were both bawling. So, we pushed back from each other. I said, “I love you, Dad.” He said, “I love you, too, son.” That single moment completely transformed our entire family lineage. I don’t know what happened in that moment. I guess that probably a century of sorrows bubbled to the surface in his life; but here’s what happened. We started telling each other, all the time, “I love you.” “I love you, Dad.” “I love you, Pat.” “I love you.” “I love you.” My mother and my brothers got wind of this, and they got jealous. They wanted in on it, too. They started saying, “Well, I love you, too.” So, we started telling them that we loved them. Within a few months, our entire family became a family of huggers and verbal expressers of love. It was unbelievable! Dennis: And so, right now, I want to seat your father across the table from you. Bob: But I’m just curious—would you say asking your dad to give you a hug—was that the most courageous thing you ever did? Patrick: I am saying that that is among the most courageous things I’ve ever done. Yes. Bob: Took a risk—a relational risk. Dennis: So, okay, back to the assignment. Patrick: Back to the assignment. Dennis: Just address your dad. You’re not talking to me—you’re not talking to Bob. Address your dad, and give him a tribute for what he meant to you. The thing I love about you, Dad, is your decision that your life’s ambition was to not go the way of your dad. You didn’t get the right help along the way, but you had such a good heart and you were such a sweet man. You loved my mother so well—56-year marriage. It was awesome! It was awesome. So, it may not have worked out for you with me and my three brothers as well as you would have liked; but you had a great marriage, and I know that you had a good heart. It ended well, Dad, because through Patsy, as you know, I became a Christian. Then, through me, you and Mom became Christians. Then, Robert, before he died of the heroin overdose, we were able to lead him to Jesus. Pete has become a Christian. Then, look at my children and how they are walking with the Lord. I have to say, Dad, that I wish you could be here to see it—us breaking the cycle. It’s just so unfair that you got into a church that did not have a vision to disciple you to be a godly man, husband, and father—the thing you went there for, the thing you wanted most—but I did! So, we have broken the cycle. We have been able to set the family lineage on a whole new course, for generations to come. We’ve been able to graft the Gospel back into our family line. It’s because of the courageous decision that you made to break the cycle—to not go the way of your dad. I love you so much, Dad. I know there are men, listening today, that want to say to their dads, too, how much they love them. So, be blessed, men. Be blessed, and don’t hold back. For three decades Patrick Morley has been regarded as one of America's most respected authorities on the unique challenges and opportunities that men face.After spending the first part of his career in the highly competitive world of real estate development, Patrick has been used throughout the world to help men think more deeply about their lives.In 1973 Patrick founded Morley Properties, which, for several years, was hailed as one of Florida's 100 largest privately held companies. During this time he was the president or managing partner of 59 companies and partnerships.Every Friday morning since 1986, Patrick has taught a Bible study to approximately 10,000 men —150 men live in Orlando, Florida and the others through a Video Bible Study webcast over the Internet in all 50 states and throughout the world.In 1989 he wrote The Man in the Mirror, a landmark book that poured from his own search for meaning, purpose, and a deeper relationship with God. With over 3,000,000 copies, this best-selling book has captured the imaginations men worldwide, and was selected as one of the 100 most influential Christian books of the twentieth century. He has written 20 books—six of which have received critical acclaim—and has readers in over 48 countries.In 1991, Patrick founded Man in the Mirror with a vision “for every church to disciple every man." They have impacted 12,000,000 men through 35,000 churches, including 1,300 seminars, 9,000,000+ books distributed, 2,000,000+ Bible study video downloads, 11,500 leaders trained in nearly 4,000 churches, and by partnering with 12 denominations representing 145,000 of America's 330,000 churches. They are currently in the process of hiring Area Directors to put “boots on the ground” and serve 330 regions, each made up of approximately 1,000,000 people and 1,000 churches.Through his speaking and writing he is a tireless advocate for men, encouraging and inspiring them to change their lives in Christ. 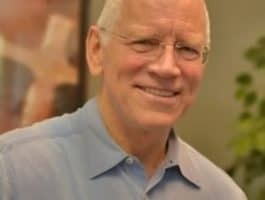 He has written over 750 articles to help men and leaders, has appeared on several hundred of radio and television programs, and speaks to men daily through The Man in the Mirror radio program carried over 700 stations nationwide. "The ministry of Man in the Mirror exists," says Patrick Morley, "in answer to the prayers of all those wives, mothers, and grandmothers who have for decades been praying for the men in their lives. "Patrick Morley graduated with honors from the University of Central Florida, which selected him to receive its Distinguished Alumnus Award in 1984. He has earned a Ph.D. in Management and completed post-graduate studies at the Harvard Business School and Oxford University, and graduated from Reformed Theological Seminary. He lives in Winter Park, FL with his wife, Patsy. They have two married children and four grandchildren.